In the south, we don’t stuff our birds for the holiday meal. We make a dressing that is served as a side dish. This is my mom’s recipe and I would probably be disowned if I served Christmas dinner without it. I always make two 9×13 pans because we have a large crowd but this recipe would be easy to cut in half. Begin by cooking your chicken with onions, celery, salt and pepper, in water, to create a stock. I use a whole, cut-up chicken and simmer mine for about 2 hours. 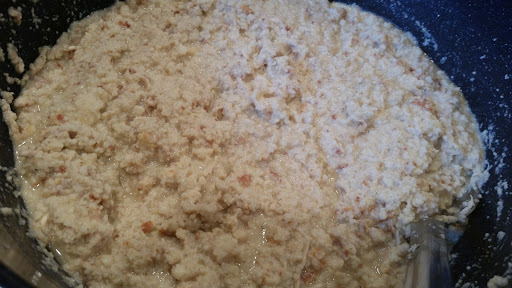 What is not used for the dressing becomes chicken salad, chicken and dumplings, or chicken and rice soup. Strain the stock reserving some of the onions and celery. Just look at this luscious stock! 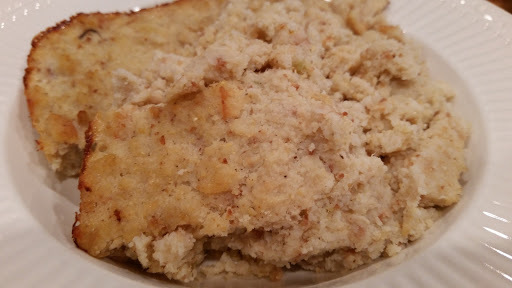 Make your cornbread and set aside to cool. I’ll post that recipe at another time. In a large mixing bowl, finely crumble the cornbread. Clean hands are your best friend here. Add the reserved onions and celery, 2 eggs, and the chopped chicken. Next, add your chicken stock. Begin by adding 6 cups, mixing well and adding more stock as needed. 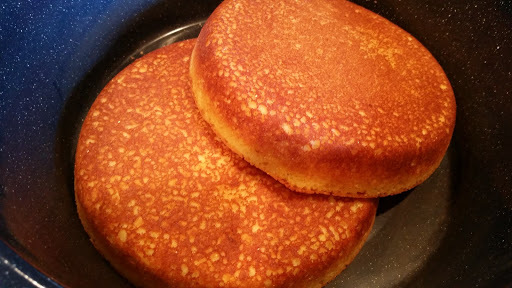 A lot will depend on your cornbread. I used almost 9 cups for this, but I don’t measure when I make cornbread so my amount always varies. Next, add your salt, pepper, and ground sage. This is really to taste. I used 2 teaspoons of sage for this. Remember, sage becomes stronger the longer it sits, so take that into consideration. I made this dressing on Tuesday and it will not be baked until Friday, so I used a little less than I normally would have. 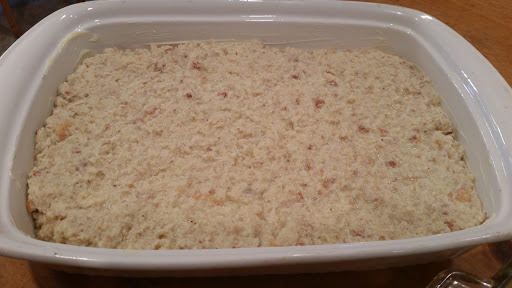 Butter a 9×13 baking dish with butter and add the dressing. Bake at 375 degrees approximately 35 minutes or until it is golden brown and a toothpick inserted in the center comes out clean. The plan was to make a picture when it came out of the oven, but that didn’t happen. So here is a picture of the leftovers HA!